Damn, console manufacturers really did get a little skimpy on the pack-ins as time went on, didn’t they? 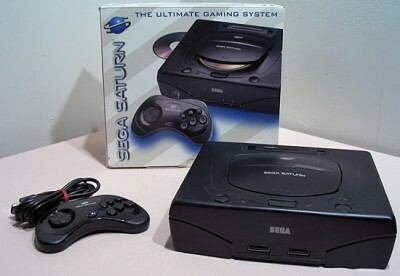 I can’t complain, though – I bought this system right at the end of the Saturn’s lifespan for $50. It was a great deal at the time, and to Sega’s credit (or rather, out of their desperation), I did still get the “three-pack” of free games included in that price. 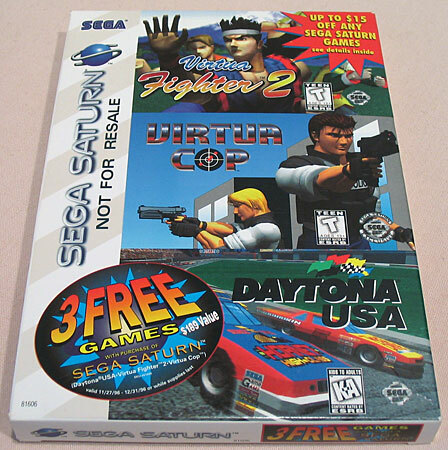 Sega only briefly offered a real pack-in game with the console, but once it became clear that they were fighting a losing battle against Nintendo and Sony, they produced a package containing Virtua Cop, Virtua Fighter 2 and Daytona USA that they gave away free with a system purchase. It was actually a great deal even before the system hit $50, because when they first started doing it these were all fairly recent games, with VF2, especially, being probably among the best games for the system. Pack-ins or not, I don’t really know of any manufacturer that’s given away three free games with a new system purchase (though several, including Atari, Sega, and Microsoft, have given away two). Note that in Sega math these three games are a “$189 value”. The only way they could come up with that would be to price two of the games at $60 and one at $69. To my knowledge, no Saturn game (including any of these) ever carried MSRP’s like those. 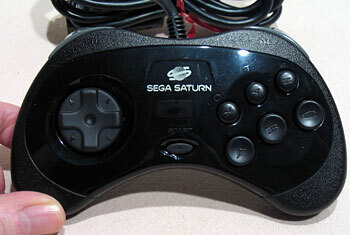 I love the Saturn. I lament the fact that it took so long for me to buy one, though I did consider it when the PlayStation and Saturn were first competing and it wasn’t clear who the winner would be (I actually had it pegged right then, though – my mom was going to buy me either one as a college graduation present, and I remember thinking out loud to her something to the effect of “well, the Saturn’s got the better games now, but the PlayStation has more potential in the future”). I chose the PlayStation, and while I like my PlayStation too, I definitely think the Saturn got short shrift from consumers (like myself). Next to the Neo Geo AES, it was probably the ultimate 2D system, with awesome stuff like Guardian Heroes, Shining Force III, and the Capcom Vs. series. 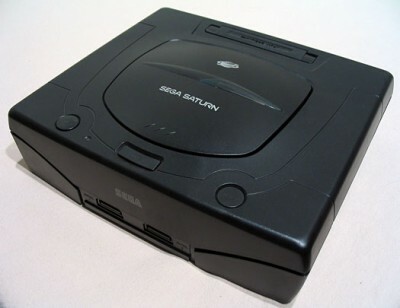 But it also had all those great Sega games like the aforementioned Virtua Fighter 2 and Virtua Cop 1&2, Sega Rally, Fighting Vipers, Nights, etc. Just a really great system. As you can see, it’s one of the later revision “round button” systems – more common anyway than the earlier oval button system (and more reliable). Pretty much the same as the Genesis 6 button controller. Check out my V-Saturn and my Skeleton Saturn for a look at the other, more exotic Saturn models I currently have. I have a launch Saturn in near perfect condition, and have 30 games for it. Just like you, I ended up getting a PS1 in 1995 instead, and didn’t buy a Saturn until 2003 off eBay. I really was shocked at how many amazing games the Saturn has. 30 games, and there are still atleast a couple dozen more that I want so badly, but are way too expensive since they are quite rare. Yup, the Saturn was an enormously underrated system that deserved so much better.